Today Google did what it does best: forgot about previous hardware and announced new stuff. Its new toy, Google Wifi (not a typo), is a $129 router with ‘smart’ features similar to its previous shiny new thing, OnHub. The new system relies on mesh Wi-Fi routing capable of killing dead spots through use of multiple access points spread throughout the home — similar to Eero. Linking these access points together creates one large network capable of delivering consistent speeds no matter where you are in your home, a feature OnHub lacks. For what it’s worth, Google also claims a single unit will have increased range over consumer-grade Wi-Fi routers. Then again, every router manufacturer under the sun makes that claim, and few actually hold up to scrutiny. We’ll just have to wait and see. For now though, it’s a shiny new toy that Google is probably going to forget about by this time next year, but it does have a pretty sweet companion app that allows you to ‘pause’ your router for that all-so-important family time. 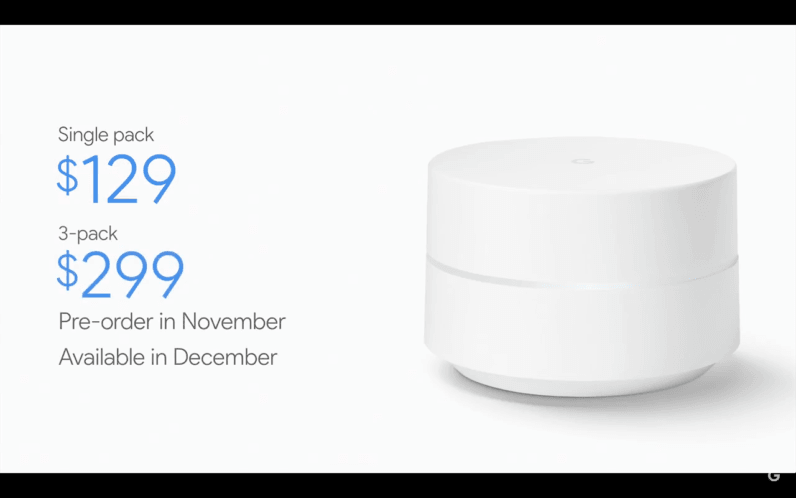 Google Wifi is $129 and available for pre-order in November. The three pack will set you back $299.